The Pesticides Control Board (PCB) has launched a 5-year strategic plan to help farmers obtain better yields on their crops while minimizing the use of pesticides, with zero residue in their produce. 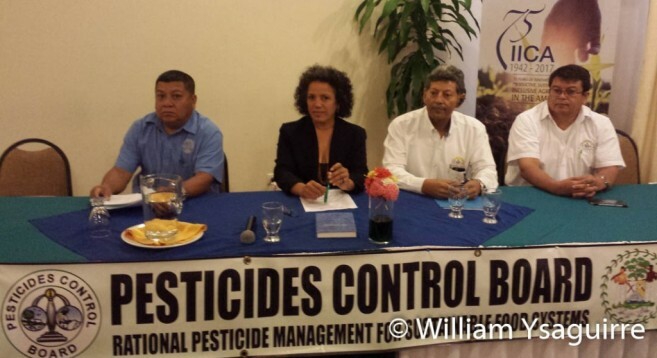 The PCB’s Registrar of Pesticides, Ms. Miriam Ochaeta-Serrut, presented the launch at the Belize Best Western Biltmore Plaza Hotel in Belize City last Thursday morning, April 20th. Consultant Dr. Dowlat Budhram explained the 11 parameters by which the plan was developed as a part of a package to strengthen the PCB as an institution. Drawing on his years of experience of best institutional practices, he had carefully evaluated the external environment in which the Board operates, and what was its defined mission and current strategy. He then examined the Board’s leadership needs, its organizational culture and management practices. He reviewed the Board’s systems for evaluation, monitoring and planning; and its work environment for the staff and the physical infrastructure. He also examined how job responsibilities were defined, what were the staff’s individual needs and values, and what motivation incentives exists; and lastly what systems were in place to evaluate the performance of the staff and the institution as a whole. Ochaeta-Serrut explained how the strategy calls for the public to be educated so that they minimize their use of pesticides, and are always mindful of these chemicals’ harmful impacts on the environment, so that they may use pesticides in a responsible manner. While pesticides may be seen as the best way to achieve maximum agricultural yield, the department encourages the use of organic methods of pest control as much as possible; and even when pesticides are applied minimally, farmers need to ensure that there will be no residue on the farm produce at harvest time. The plan emphasizes the importance for the farmers to understand the need to keep pesticides out of the environment as much as possible, and the danger of over-application resulting in the development of strains of pests which are resistant to the pesticides used. The plan calls for importers, retailers and users to understand that they are handling a poisonous, toxic substance which must be handled with proper precautions, and that therefore all use should be kept to a minimum. The plan is for a both suppliers and users to be properly trained and certified, and them to monitor how farmers use pesticides. The strategic plan was developed with the support of the Inter-American Institute for Cooperation in Agriculture (IICA) and the United Nations Development Programme, and so IICA’s representative Yvette Alonzo delivered the closing remarks. The Pesticides Control Board operates on an annual budget of $600,000, which is funded in part from fees collected for licenses and permits, and a $21,000 annual grant from the Government of Belize.